Hello Everyone! I hope everyone had a great holiday weekend! It’s hard to believe it is September already, and we are moving into Fall projects! Are you looking forward to Fall? As much as I like all things Fall, and I love Halloween, I am always sad to say goodbye to summer. One project I hope to tackle in the coming months is to overhaul a multipurpose room. That’s why my favorite link from last week was this Office & Guest Room Makeover from Amy @ Delineate Your Dwelling! I have a room filled with craft supplies that also occasionally doubles for guests! Amy did an amazing job. 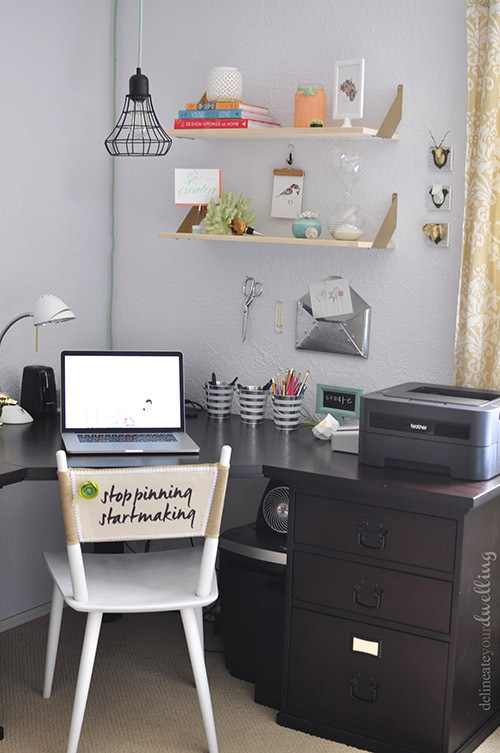 I just love her chair…”stop pinning start making” – that would be me! It’s good to see you back again this week for another Whimsy Wednesday! As always we had some amazing DIY and recipes linked up last week! We share and feature so many projects on our blogs and on Google+! Thanks so much for sharing in our link party…let’s do it again tonight! It’s time for Whimsy Wednesday Link Party 131! Just click on our photos to visit each of our blogs! We are thrilled to let you know that Whimsy Wednesday is where G+ meets Link Party. We will be sharing our favorites on G+ bringing great exposer to your site with awesome SEO results. With five blogs that’s five times the exposure! Did you all know that Whimsy Wednesdays is thee GOOGLE+ sharing party? All of us are active on G+ with over 400,000 people having us in their circles combined. We are looking to share your posts, which means just a bit of interaction for you, but we can’t share if you’re not there! So, to make it easier for us to share your content, use the hashtag #WhimsyWednesdays when you share your content on G+. We’ll be searching the hashtag all week to see who’s taking part in the party. I shared my Vintage Chair Drink Stand! 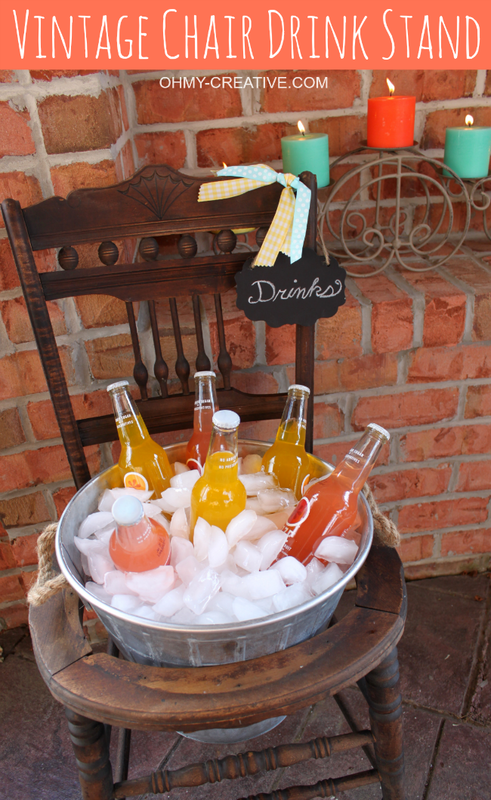 A perfect way to repurpose an old chair! 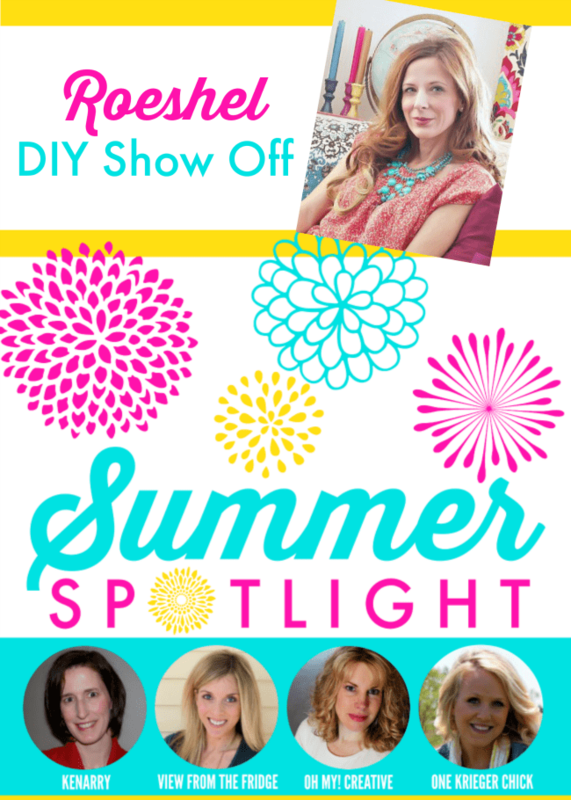 Our Summer Spotlight Feature this week was Roeshel from DIY Show Off! 1 Grab a party button and place it on your list of parties. 2 Don’t link up any Etsy shops. But, everything else is accepted! 3 Don’t link and leave! We all love comments – take a few minutes and visit a few other projects and leave a few kind words! 4 Follow all of the hosts! Click on the Whimsy Wednesday graphic at the top to go to all of the blogs and follow along! Please be aware that by sharing at Whimsy Wednesdays, you are giving permission for your projects to be shared on social media and in round up posts, which will be pinned using a scheduling tool for maximum exposure. The feature will include a link back to you. DO NOT link up photos that you have purchased and do not have permission to share. You’ve made my week! Thank you for the feature this week!! Anytime, Amy! You are so talented! I need to have that chair!! Hi Susan! Thanks so much to you and the ladies for hosting – hope you had a great holiday weekend and have a wonderful week! G’day! Thanks for hosting such a great party!